NASHVILLE, Tenn. – Middle Tennessee’s Brent Stockstill and Jovante Moffatt were named the Offensive and Defensive Players of the Week, respectively, by the Tennessee Sportswriters Association for their efforts in contests from October 1-7. Stockstill completed 25-of-40 passes for 317 yards and two touchdowns while running for an additional 31 yards and a score in a 34-17 victory at Marshall, the first in program history in Huntington. The Murfreesboro, Tenn., native was 11-for-15 passing for 101 yards and one TD in the third quarter alone, helping the Blue Raiders erase a halftime deficit and take the lead for good. The redshirt senior also topped the 10,000-yard mark in the win, becoming one of just nine C-USA quarterbacks to achieve the feat and one of 24 in NCAA history. It marked his 16th career 300-yard passing game. Stockstill has completed 67 percent of his throws for 1,299 yards, 10 touchdowns and three interceptions through five games this season. Moffatt posted a career-best 17 tackles with a forced fumble and two pass breakups in just his second game of the season in the win at Marshall. The Union City, Tenn., native recorded six solo stops and his forced fumble in the second quarter set-up a field goal that tied the game at 10. The senior safety was part of a Blue Raider defense that limited the Thundering Herd to 149 total yards and seven points in the second half, as Middle Tennessee erased a 17-10 halftime deficit. Moffatt has 25 tackles with one interception and three pass breakups this year. NASHVILLE, Tenn. – King University’s Ben Delisle earned Tennessee Sports Writers Association Men’s Soccer Player of the Week accolades, collecting three goals with one game-winner in two matches for the Tornado. The Montreal, Quebec, native netted the game-winner in a 2-1 win against North Greeneville, scoring in the 41st minute on an assist from Jairo Ruiz Caram. The sophomore added two goals against the University of Mount Olive, scoring the club’s first goal in the 11th minute on an assist from Carlos Saavedra. He added an unassisted score in the 28th minute, as the Tornado scored three times in the first 30 minutes en route to a 4-1 victory. Delisle has a team-leading five goals this season for King. 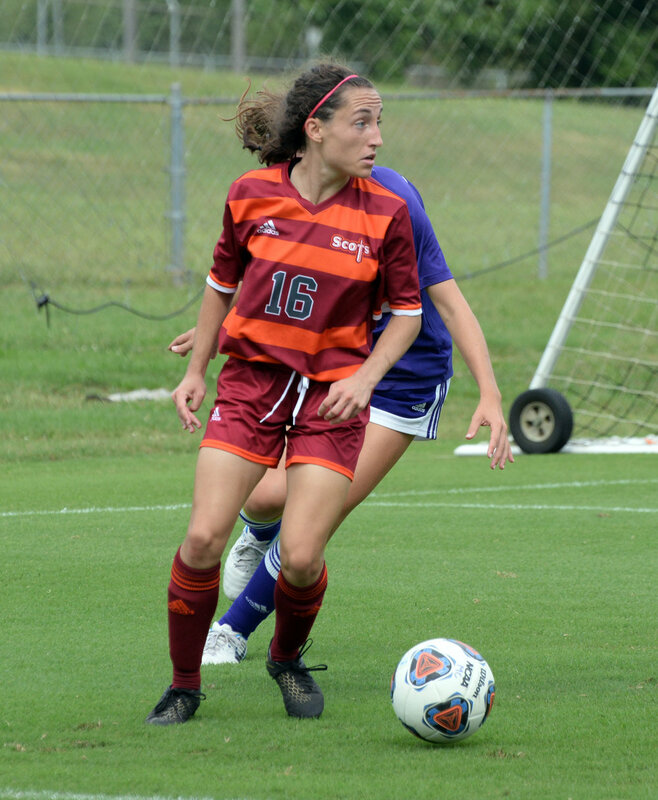 NASHVILLE, Tenn. – Maryville College’s Shannon Reagan posted Tennessee Sports Writers Association Women’s Soccer Player of the Week honors, netting two goals with one assist in two outings for the Scots. The Tullahoma, Tenn., native registered two goals and one assist in a victory at Wesleyan College. The junior netted the game-winner in the 14th minute and posted her second goal of the match just six minutes later. She also assisted on a Lexie Hill score in the 52nd minute. Reagan ranks second on the club with five goals and leads the Scots with four assists this season. NASHVILLE, Tenn. – Maryville College’s Brianne Sidner was named the Tennessee Sports Writers Association’s Volleyball Player of the Week, registering a pair of double-doubles in three matches for the Scots. The Marietta, Ga., native posted 17 kills and a career-high 20 digs in a four-set loss at Birmingham Southern, adding two blocks. The junior followed that with 11 kills and 14 digs in a five-set win over Huntingdon College for her fifth double-double of the year. Sidner ended the week with six kills, 14 digs and two blocks in a sweep against Piedmont College. She averaged 11.33 kills and 16.0 digs per match during the week. Sidner has a team-leading 162 kills (2.70 per set) and 24 service aces along with 163 digs (2.72 per set) and 21 total blocks this season.